* This item will be custom made per your metal specifications and will be shipped on or before Wednesday May 22, 2019. You can request a stock inquiry from the Jewel Box once it has been added. This city chic fringe necklace gets a dose of whimsy with five dangling diamond baguettes (0.60ctw) that dance with your every move! We love the combination of the clean lines and the cool crisp reflection of these stones paired with the flirty movement. 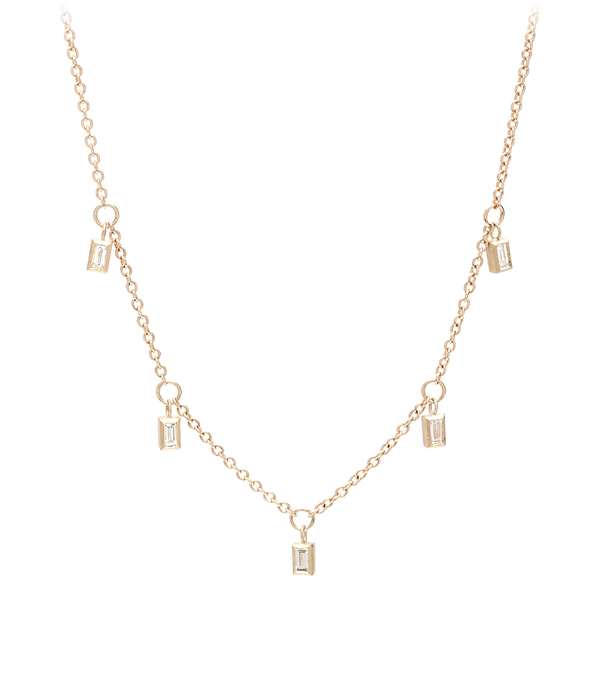 Each diamond baguette is set in a solid 14K gold bezel and hangs from a classic cable chain. A longer 20 inches length allows you the versatility to wear alone for a sophisticated look, or in layers and layers for boho elegant charm! Categories: City Sophisticate, Necklaces, Regency.